OkCupid has been in the online dating game since 2004. That’s quite a while now, and the brand name is anything but unknown with over 10 million registered users. However, they did undergo a massive rebranding campaign in 2018. So, that’s the year when what we now call OkCupid has begun the way we know it. With the new slogan – ‘Dating deserves better,’ – they have decided to cut all the strings that may hold an old and reputable service back. OkCupid has redefined itself by addressing every frustrating point of that one may associate with online dating and shying away neither from minorities nor majorities. Although it may seem like throwing your image out the window, OkCupid is indeed keen on their brand image. But it is not the image we are used to seeing on a dating platform. Meanwhile, they focus not only on helping users to match but also to have fun with the service. It means eliminating every boring or otherwise off-putting element of online dating. These are, for example, writing a five-paragraph essay about your dream relationship or answering countless questions you couldn’t care less about. In addition, making an online dating experience enjoyable also means keeping users safe from creeps and other sorts of ill-intended people. These two goals may seem mutually exclusive: how can you provide a safe experience without forcing users to introduce themselves properly? OkCupid didn’t shy away from addressing this seeming paradox, – let’s take it to step by step and see how well it has turned out. One of the polarizing points that OkCupid has addressed is apparent at the very first steps as you set up your profile. The site offers you as many as 12 options from which you are to choose your gender identity. So, a Trumpie or another right-wing conservative gets a red light right off and goes to another website. If it wasn’t enough for him or her, he or she gets another blow right away: 20 sexual orientations to choose from. One may argue that such a policy is bad for business because it scares off a fair share of potential users. This is the ball-less approach that most dating services adopt. OkCupid, on the other hand, had the guts to address this and achieved two goals. First of all, deliberately losing a part of the potential audience makes them look like a company with principles as opposed to a bunch of money-grabbing sellouts. Secondly, it creates a safe space for progressive people willing to embrace the impending future. There are few things more disappointing about online dating than to hook up with a hottie only to start a heated political debate. And both advocates and opponents of OkCupid progressive approach can agree upon that. So, they all find the site policies beneficial, leaving arguing to YouTube comment sections and other social media. Another thing both parties share is how they hate filling in their profile questionnaires. It makes one feel like back at school, and not a fun part of it. It can be so tedious that a user may even get discouraged from finalizing the process. Besides, many of the regular questions are too straightforward – for example, ‘Do you cheat?’ or ‘Would you describe yourself as a tidy person?’ They apparently suggest the only one answer, leading some people to answer insincerely, which undermines the whole idea of those questionnaires. To create a profile on OkCupid, you will also need to answer some questions, but they put them less directly, which both brings out more sincerity and makes the process more fun. To give you an idea, you’ll have to answer questions like ‘Would you rather kiss on a cruise boat or in a tent?’ or ‘Would you like your future relationship to last as long as your previous one?’ None of the questions is obligatory to answer, but there is a fixed amount of answers you must give before you can move on with your profile. In other words, you can choose which questions you are comfortable to answer and skip the others. The process is fun and takes no more than five minutes. Once done, you can upload a photo and get going. We have already briefly touched upon this. The people on OkCupid are liberated individuals who may be up for any sort of romantic involvement. That doesn’t narrow down specifically to one-night stands or lasting marriages: it can be anything in between and beyond. So, once again, if you are a ‘traditional family values advocate’ who cannot see any other ‘respectable’ goal for dating than marriage (along with one or two ‘non-respectable’ goals,), OkCupid is just not for you. You’d better try your luck with the likes of eHarmony. On the other hand, if your date’s views on abortion laws or the global warming are more important to you than their determination to have a particular amount of children, then you’re in the right place. Along with the questions that users answer while creating a profile, there are also a variety of further questions. You may answer them if you think that this will make your profile more insightful for your potential matches. These, of course, include the widest variety of politically charged questions that your average dating platform would shy away from. Putting it briefly, OkCupid is for those who want to have meaningful (but not too heated) conversations about the topics of interest with their date (or partner) rather than perform traditional male and female duties for each other. Being the safe space for its crowd like we’ve described, OkCupid allows its users to feel more relaxed and engage into conversations more willingly. This, combined with the simple math of OkCupid’s extensive database, means that you won’t have to wait nervously to get your first messages, responses, or likes. By the way, the interface is appealingly minimalistic: you only have two notification bars – one for likes and one for messages. So, even a less-than-savvy first-time user has no chance of getting confused. This is refreshing compared to other services where they have countless winks, nudges, virtual presents (seriously, whose bright idea was a virtual box of chocolate, huh, AdultFriendFinder? ), etc. The app version has a Tinder-like swiping feature, but it adds a few pieces of information to the photo, so you can have a better idea about the person before you swipe left or right. The process is also made more fun by the app popping up random questions at random times in between. Other than that, it shares the full functionality of the desktop version. Much like other dating platforms, OkCupid was receiving numerous complaints from users who got bombarded with messages from ‘random creeps’ (and apparently, couldn’t use the block option for some reason). So, OKCupid dealt with the issue in their radical fashion: they removed the feature of open messaging altogether. Instead, you can only message the users who liked you and get messages from those you liked. It has both pros and cons. On the one hand, it cuts you off from a person whose profile you didn’t get to yet or from someone whose profile pic seemed ‘creepy’ to you at first glance. From this point of view, this approach seems superficial. It looks like merely ignoring or blocking unwanted people would be enough. On the other hand, you get to chat with users whom you like and, at the same time, who evidently like you back. This boosts the confidence on both sides and provides for more quality messaging. So, it’s up to you to prioritize. There are plenty of dating platforms that allow users to sign up for free only to charge them for literally anything later on. With OkCupid, you get all the essential functions for free. Nevertheless, there are paid membership plans. They are at a reasonable price, and the cost depends on how long you plan to use them. The A-List costs between $6.95 and $9.95. And the A-List Premium is from $19.90 to $24.90. Aside from getting rid of ads, the one feature that might return your money’s worth is the DoubleTake. Essentially, it’s an app within an app that allows you to see more pics and info of a user before liking or disliking them. Usually, you would be able to see that much only after liking the person. If you want to know more about the paid features, OkCupid describes them quite comprehensively, but our verdict remains the same: one can do just as fine with a free membership. We have already mentioned the complications about OkCupid messaging system. Their valiant quest to make the safe space even safer is admirable, indeed. It would, however, make much more sense to ask users whether or not they want it. We are sure that the users would benefit from choosing themselves whether they would like to accept messages from complete strangers or only from those they have liked. Aside from that, there’s only one particular inconvenience about OkCupid. Its efficiency rapidly approaches zero the farther you get from metropolitan areas. While it makes sense that less populated areas have fewer profiles on any given service, there is one more detail about OkCupid. We have described the kind of crowds it attracts. These crowds tend to concentrate in bigger cities. And when people like this find themselves in a less populated rural area, they are either desperate to get out this hole or reluctant to out themselves (not mutually exclusive). So, you can boast a vibrant liberated personality while fashion-blogging from East Village, NYC. But you shouldn’t expect too much of OkCupid when you visit your family in East Village of Des Moines. On the other hand, if there’s one person you can potentially date in your drowsy little town, OkCupid may be the only way to connect with them. If we had to sum up OkCupid with just one word, it would be ‘trendy.’ It can also be called a stereotype of a hipster online dating platform (whether to use that term as an offence or a compliment is up to you). In their effort to combine the features of a fully-fledged dating website and a simplistic app, they realized that they have to face twice more competition. It got clear that the flawless design and exciting new features alone wouldn’t do the trick. So, they made the bold move of venturing for an unexplored niche. 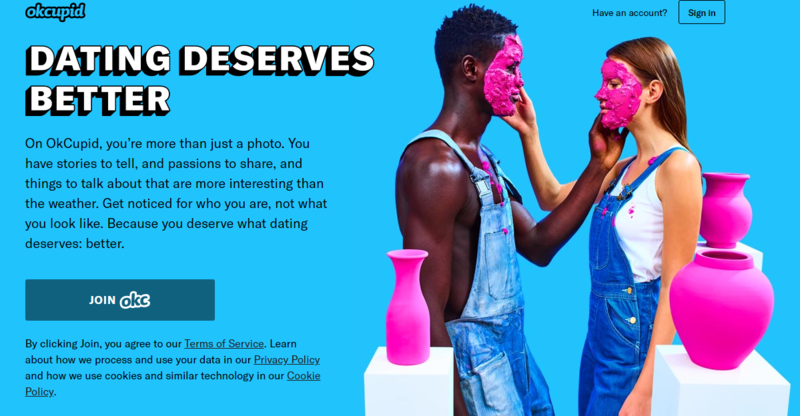 They started challenging the heteronormativity that’s so characteristic of most dating services aimed at the so-called ‘general audience.’ With OkCupid, none of the 12 genders or 20 sexualities has to remain closeted in their niche platforms any longer. If you feel like being a part of a diverse and vibrant dating community, you finally have just the place you were looking for. If not, there’s still plenty of fish (pun intended) in the sea for you.